From the parking area, walk back down the entrance road. Just before reaching the bridge over the western branch of the Mamaroneck River, turn right on a gravel road blocked off with a cable barrier. Follow this road as it heads southwest, parallel to the Mamaroneck River. Unfortunately, you can hear the sounds of the traffic on Mamaroneck Avenue (on the other side of the river), although this busy road is largely shielded from view by the trees. In 0.4 mile, you'll reach a Y-intersection. Here, you should bear left and cross a stone-faced bridge, with the wide river visible through the trees on the left. The road you are following now becomes somewhat rougher. In another 0.4 mile, you'll pass a wetland to the left. Just beyond, the road curves to the right and passes between two huge boulders. By now, the trail has moved away from the road, and the noise of the traffic can barely be heard. A short distance beyond, just before reaching a boulder on the right side of the trail, you'll notice a tree with a double orange blaze. Turn left onto a narrower path, cross a small stream on rocks, and follow a woods road gently uphill. Near the top of the climb, you'll pass a split boulder to the left. The path now narrows to a trail, with houses visible to the left. After passing small ponds, first to the right, then to the left, the trail once again approaches busy Mamaroneck Avenue. It descends slightly, passes a modern brick house, and bears right, heading uphill. The trail once more widens to a woods road, and some old white blazes begin to appear along the route. About a mile and a half from the start of the hike, you'll cross a stone-faced bridge over a stream and reach a T-intersection. Here, you should turn left. After passing some interesting rock formations on the right, you'll encounter a huge blowdown that blocks the trail. Follow a footpath to the right that skirts the fallen tree and returns to the woods road that you've been following. Just past two unmarked trails that lead to the left, you'll reach an abandoned stone building. Stay to the right and continue ahead on the woods road that you have been following. Houses are soon visible through the trees to the left. You're now heading northeast, parallel to the route that you followed at the start of the hike, but further uphill. After crossing a bridge (with wooden railings) over a stream, you'll reach a junction with a woods road that leaves to the right. Continue straight ahead, uphill. Soon, you'll pass a pond to the left and come to a picnic area. Just beyond, a paved path to the right descends to the parking area where the hike began. 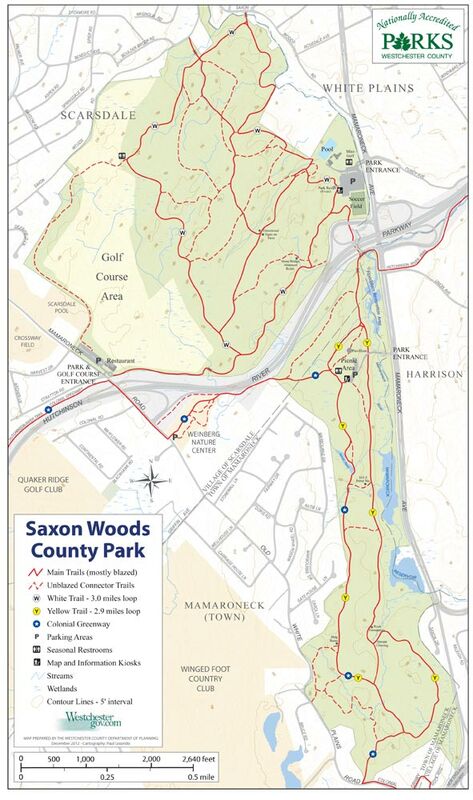 This loop hike is a pleasant stroll on woods roads in the southern section of this Westchester County Park. From the northbound Hutchinson River Parkway, take Exit 23S and turn right at the end of the exit ramp. If asouthbound, take Exit 23N and turn left. The entrance road is the first right. TAlthough a sign at the entrance states that all persons entering the park must show proof of Westchester residency, that applies only to those using the developed recreational facilities of the park, and not to hikers. Follow the entrance road up to a parking area, where the hike begins. Beeline Bus #60 along Mamaroneck Avenue.